“Hang on!” yells our safari guide, Pierre Mouton. Veering off-road, we crash after them through the bush. 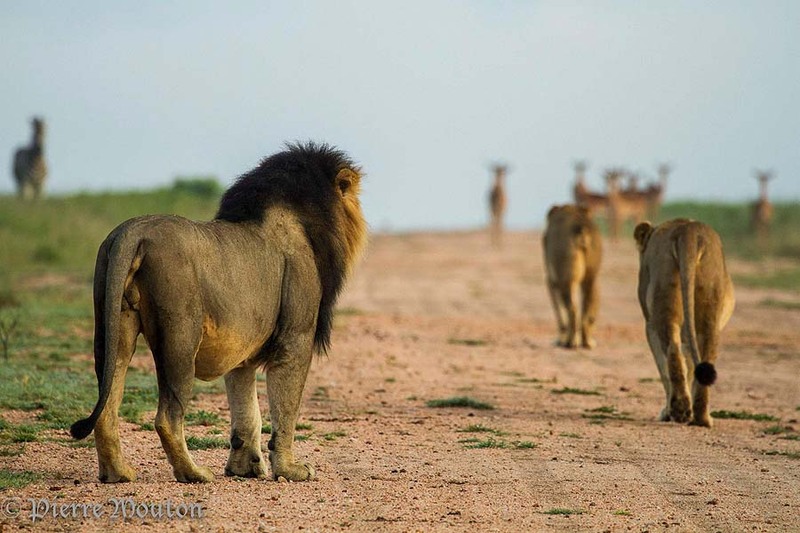 Just moments before, the pride had been sauntering slowly across a grassy plain – out for a stroll, we thought. And now, as we screech to a halt in front of them, we see that, in an instant, they have already taken down their kill. 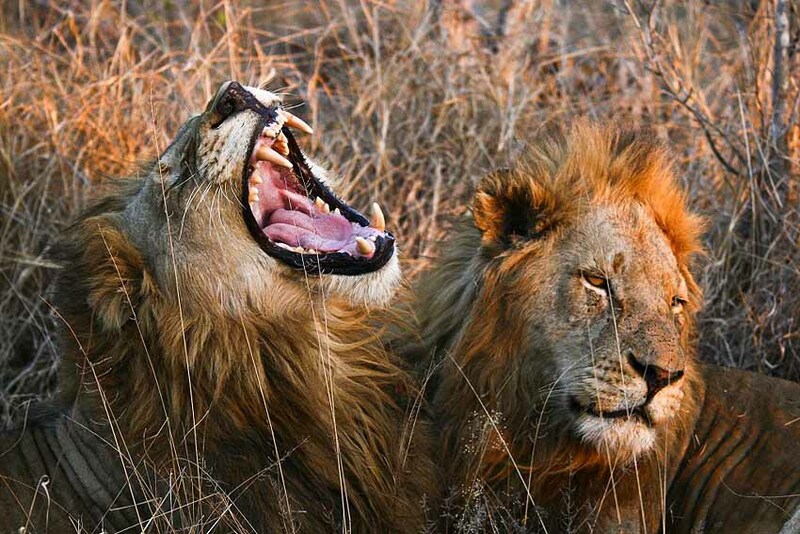 Sitting fanned out like spokes in a wheel – their furry faces smeared with blood – the lions tear at the impala. One lion rips off the antelope’s head, complete with lyre-shaped horns, and wanders off to savor its prize alone. It’s a macabre scene, a spectacle of nature at its wildest. That the lions are unfazed by our presence – and we can safely witness it from ten feet away, seated in an open Land Cruiser without high sides or roof – makes it even more surreal. “But if you get out of the vehicle, things would end very badly for you,” warns Pierre. The Sabi Sand Game Reserve, which dates back to the late 1920s, pioneered wildlife viewing by game drives in South Africa. 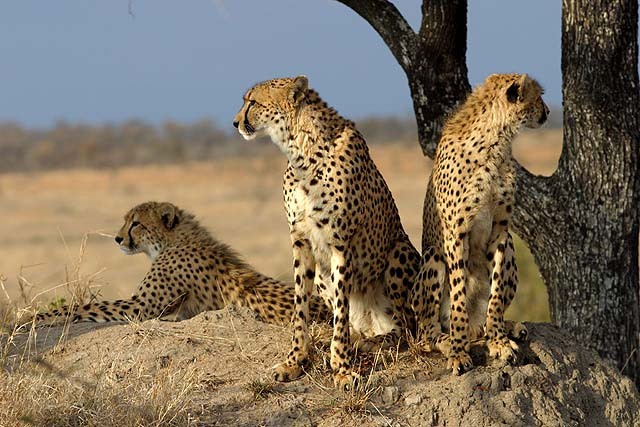 The animals are habituated to the engine sounds and people seated (but not standing up) in open game-viewing vehicles, and they go about their business undisturbed. 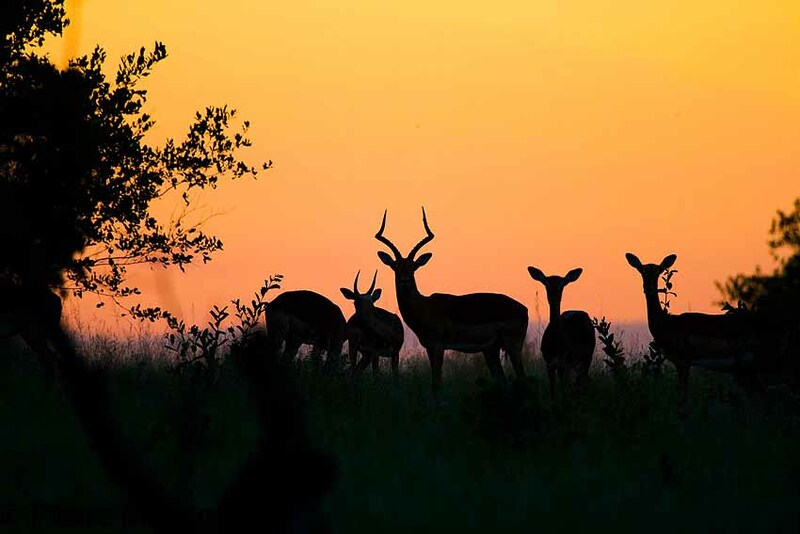 Today, the 153,000-acre sanctuary, which shares a 31-mile unfenced border with Kruger National Park, is famous for its up-close game viewing of the “Big Five” – lion, leopard, elephant, buffalo and rhino. Leopards, in particular, are a big draw. 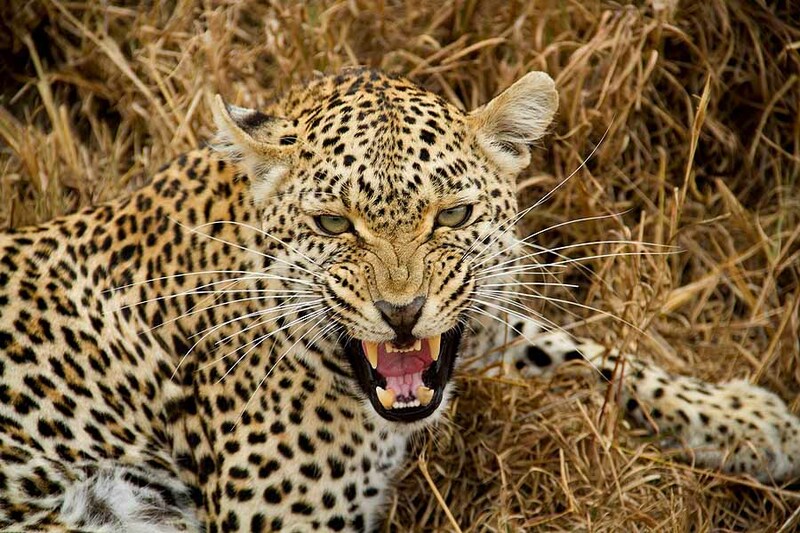 Sabi Sand has the highest concentration of leopards in the world. 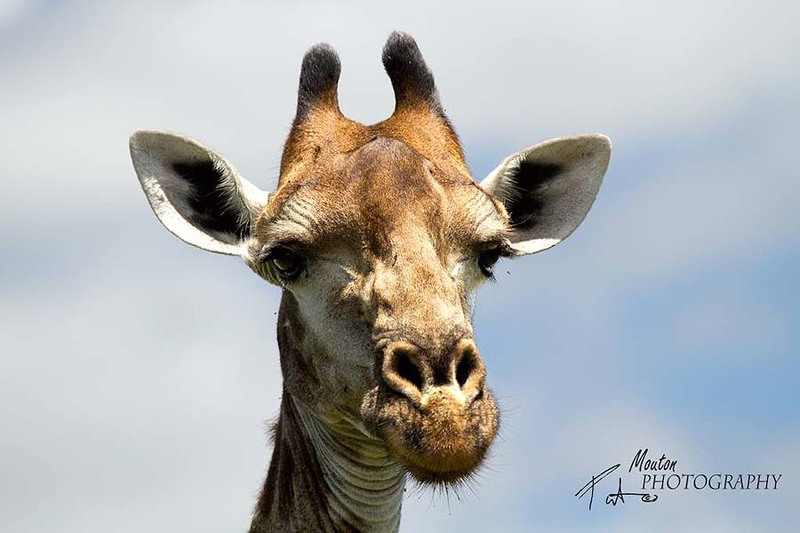 During our three-night safari at Simbambili Game Lodge in Sabi Sand, we saw lions on safari and other members of the “Big Five.” We also saw giraffes, zebras, wildebeest, cheetahs and thousands of graceful, leaping impala. Those we spotted in Thornybush Game Reserve, another private reserve adjoining Kruger. 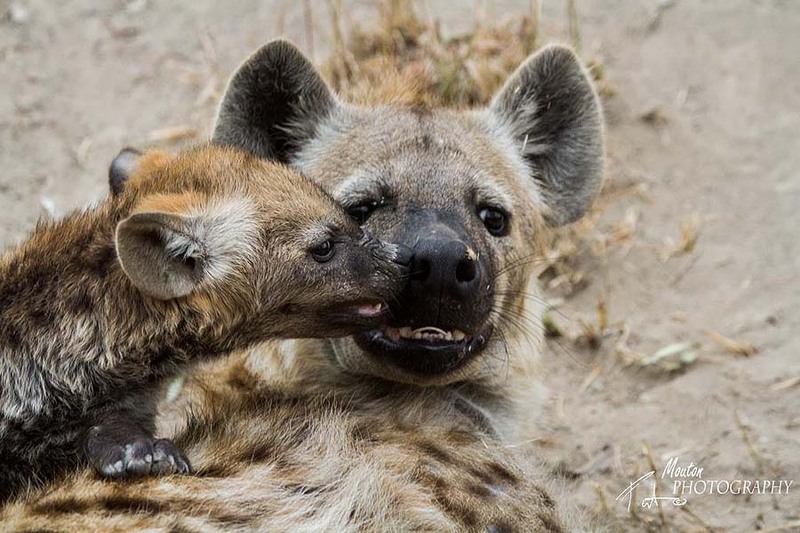 And after oohing and aahing over hyena pups suckling on their mother, we think hyenas are kinda cute – well, at least the babies. Days began at 5:30 a.m. with a knock on our door. After scarfing down a quick coffee and muffin, we’d climb into our assigned land cruiser. We were visiting in South Africa’s cooler winter months (May to September) – best game viewing – so we were grateful for the hot water bottles and blankets provided to ward off the morning chill. Then we were off, bouncing along on seriously bumpy dirt tracks criss-crossing the dry bushveld. It always amazed us how the tracker – perched precariously over the front grille without a seatbelt – never fell off. His was also the worst seat when we encountered the horny white rhino (pun intended!). This ornery rhino came a little too close to us for comfort! Driving slowly, we’d been watching this fella, as red-billed oxpeckers picked insects off his back and he snuffled about the low grasses with his flat snout. But then he started spraying urine on the dirt road in front of us, stomping and snorting as he got closer. We backed up. The rhino charged forward – and thrust his horn almost onto our poor tracker’s lap. 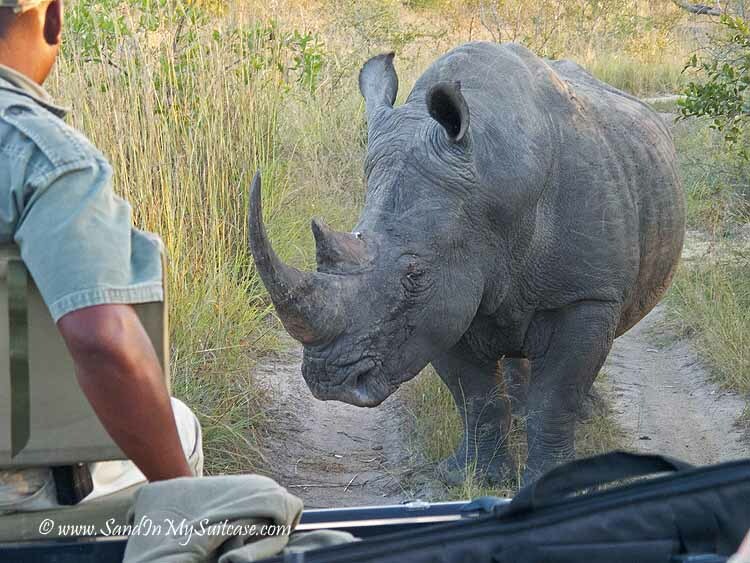 Fortunately it worked – the rhino grunted his way around us, then ambled on. Not all our game drives were so adrenalin-fueled. Once we just sat quietly gazing at a grazing herd of Cape buffalo. 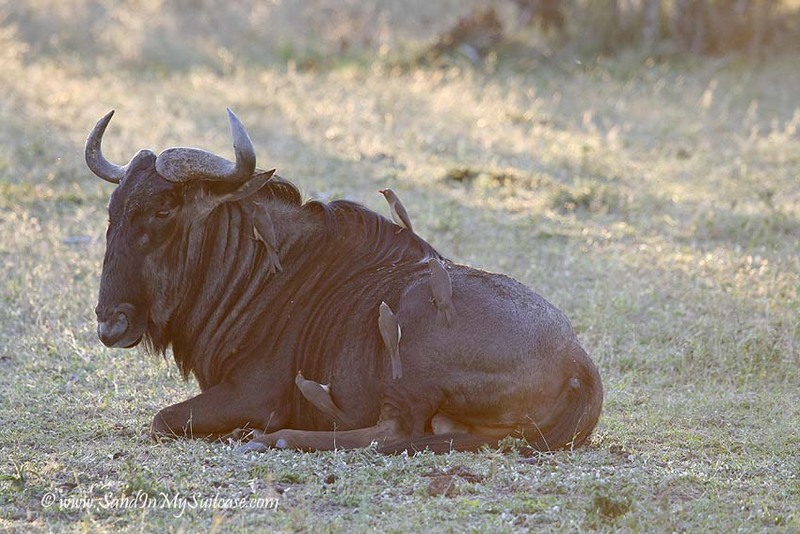 This Cape buffalo spies us warily – will he charge, or will he slowly move around us? Another time, we leisurely observed a leopard drag an impala carcass higher up a tree, while her cub slept on a branch, feet dangling. And we always stopped for sundowners on afternoon drives. Whoever invented this safari sunset ritual was a genius. 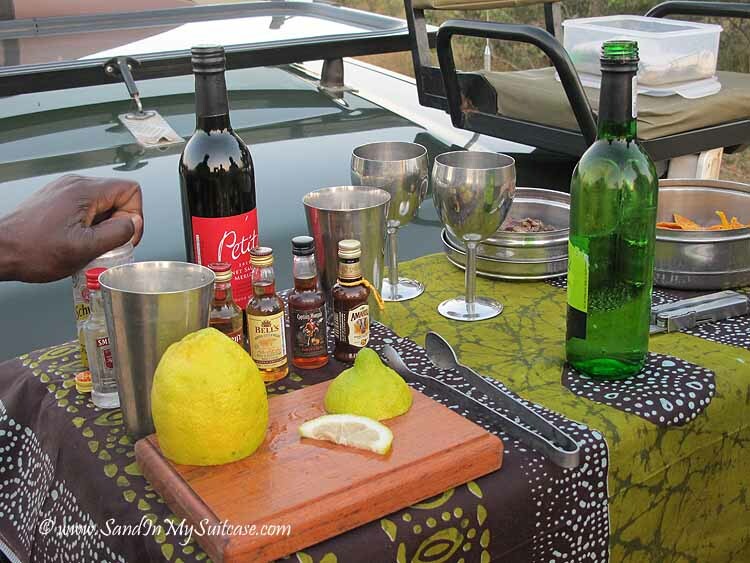 Our guide and tracker would whip out limes, liquor and ice cubes from a cooler, plus traditional South African snacks like biltong (spiced dried meat). We’d drink gin-and-tonics while stretching our legs atop a knoll, watch the sky turn pink then inky violet – and wonder how the next day could possibly be any better. There was also an hour of night driving on the return to the lodge. Everything felt different in the dark, as the bush seemed to close in on the vehicle. The tracker would shine a bright spotlight back and forth, looking for the reflecting eyes of smaller nocturnal critters, like cat-like civets and fierce honey badgers. We saw lions on safari again too (lions usually hunt at night). Back at camp, warm vanilla-scented facecloths and a glass of creamy Amarula eased the transition from wilderness to civilization. Our safari lodges (Simbambili and Thornybush Game Lodge) had electricity, air-conditioning and even in-room phones and free WiFi. But as they were unfenced and animals wandered about, we had to be escorted to dinner from our bungalow or room. And a guide had a rifle handy when we dined in the bush or outdoor boma (gathering place). In the boma, warmed by a blazing fire, we tasted African specialties like barbecued impala and pap (a cornmeal staple flavored with fresh tomato sauce). Our safari quickly took on its own rhythm. 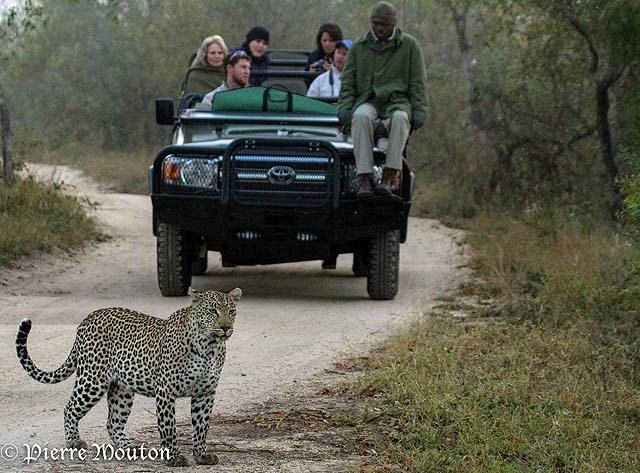 Game drive, breakfast, bush walk (with an armed ranger-guide) to learn about animal tracks and towering termite mounds, lunch, siesta, sometimes afternoon tea, game drive, dinner. And at night, deep in the wild, we’d occasionally fall asleep to the heart-thumping roars of nearby lions. We flew from North America direct to Johannesburg on South African Airways – see our review of SAA in our post SAA: Direct flights get you to the lions’ dens. For safety reasons, you should pre-book airport-hotel transfers in Johannesburg with a reputable local company like JMT Tours. 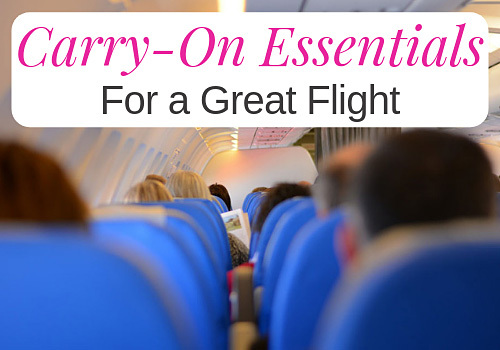 Flying time from Johannesburg to Hoedspruit airstrip (for both Thornybush and Sabi Sand game reserves) is about 60 minutes. Anti-malarial tablets should be taken (as Sabi Sand is in a malarial area). 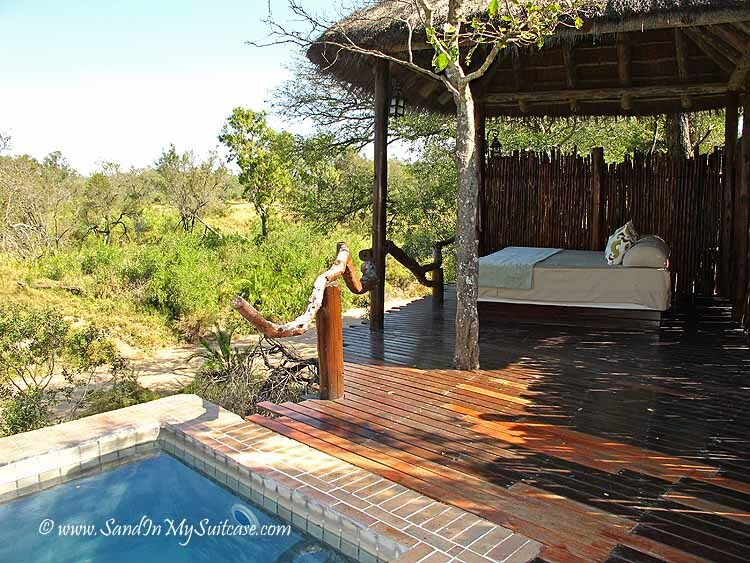 We loved both the honeymoon-worthy Simbambili Game Lodge (in Sabi Sand Game Reserve) and family-friendly Thornybush Game Lodge (in Thornybush Game Reserve). 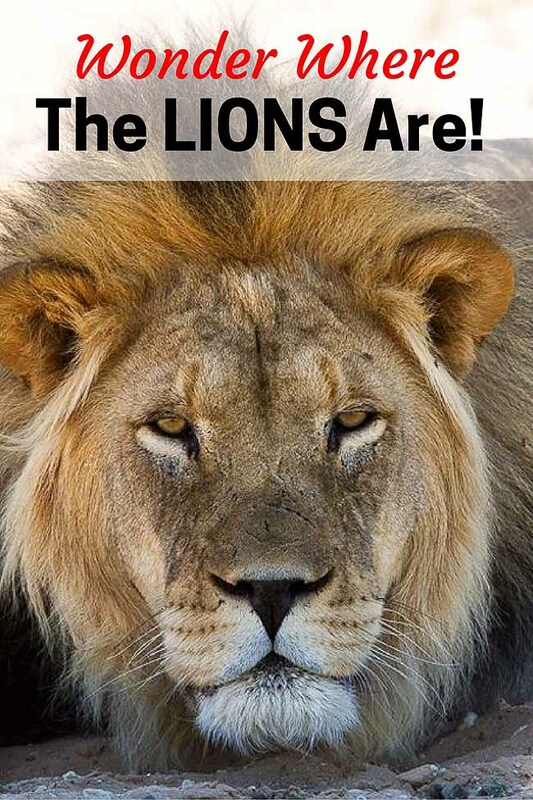 Have you seen lions in the wild? Try Uganda next. Visitors fall in love with Uganda’s breathtaking Rift Valley scenery, lush countryside and incredible biodiversity. Track our closest relatives, the Mountain Gorillas and chimpanzees, venture on safari to see the Elephants, Big Cats and incredible 1,066 species of birds, or just lie by the poolside overlooking the fabulous River Nile. Ugandans love to meet and greet new people – the country’s crafts, dance and community tourism intrigue and delight the visitor. 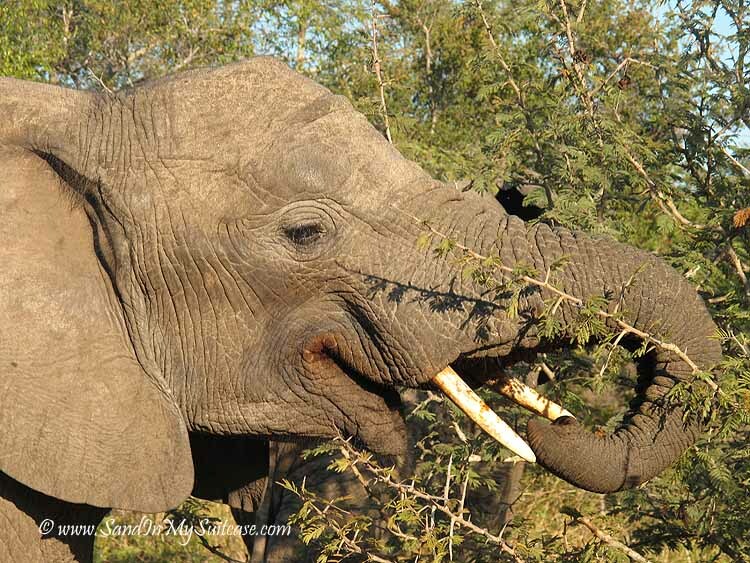 Although I was at the Kapama Reserve, it sounds like we had very similar safari experiences. 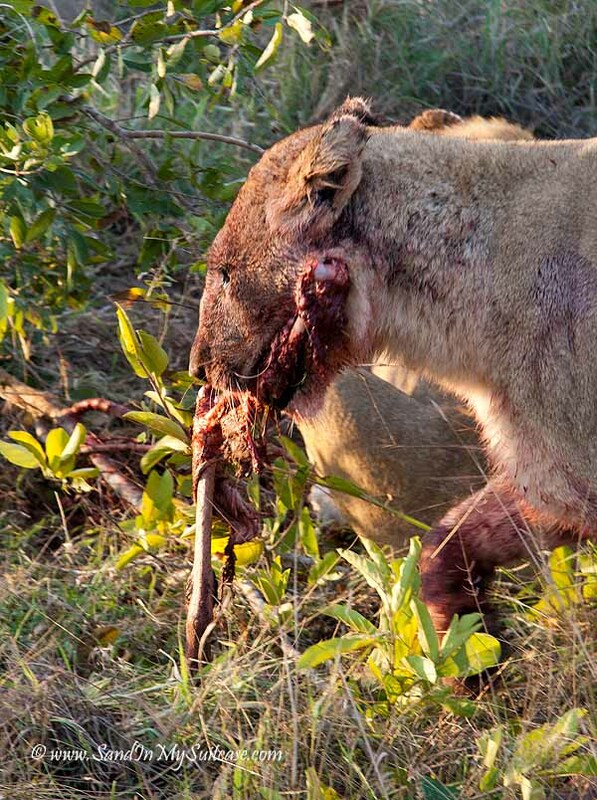 I don’t think there’s anything quite as awe-inspiring as watching lions tear apart their kill; crazy stuff that has a way of reminding me, that in spite of our insulated lives, we are still part of the food chain (especially if, like you said, we would have been dumb enough to get out of that jeep!). Loved all the photos (yours and the others you credited). The more animals we see in the wild, the more we realize how truly “wild” and unpredictable they are, no matter how “tame” they may appear (e.g., for elephant riding) or how cute they are when young. They deserve a healthy respect from us. 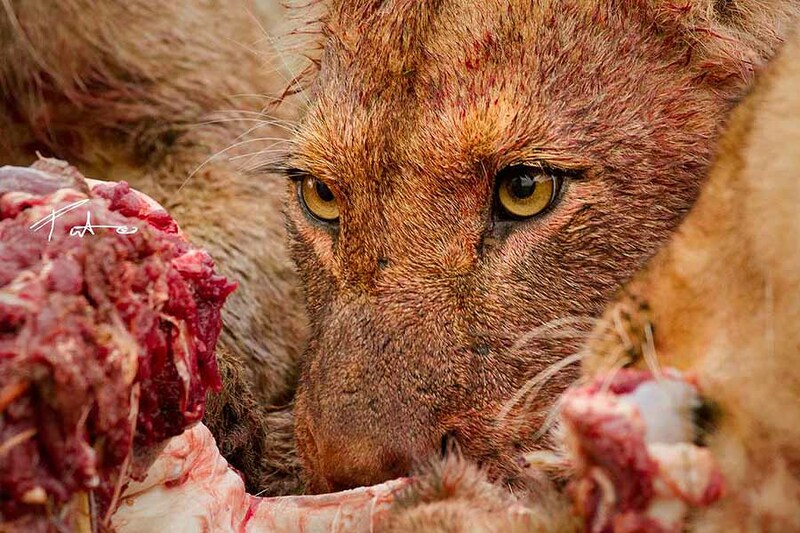 These photos are surreal…cannot believe you saw a kill. We couldn’t believe it either! How lucky did we get! And, we were told, it’s not uncommon for guests to see a lion kill. Sabi Sand Game Reserve is definitely the place to go on safari for the best chances of seeing these kinds of animal encounters. I cannot believe how beautiful these photos are. I envy you soooo much for having the opportunity to take such great pics. :) Good for you! Aren’t you sweet! But just so you don’t feel too envious, some of these photos were also taken by our guide Pierre Mouton :-). Glad you enjoy them :-). Hi Janice and George. I’m planning to go mountain biking in Ethiopia next year and I’ll have five days or so spare. Do you have any recommendations for a five day safari? Wouldn’t mind a bit of luxury because i’ll be roughing it for two weeks on the mountain bike trip. Love the photos. Ethiopia? You really are one adventurous girl! We actually had to fly through Addis Ababa after our Zambia safari (which followed our South Africa safari) to get to Zanzibar, but that’s another story. But from Ethiopia you can fly south to Lusaka, Zambia and do a river-based safari there. 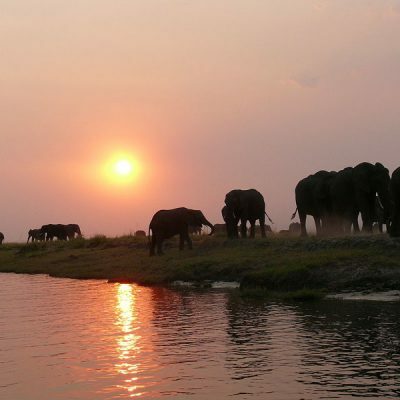 We stayed at Chiawa Camp and Old Mondoro Camp in Lower Zambezi National Park – and cannot say enough wonderful things about these camps (which are related). See https://sandinmysuitcase.com/canoeing-zambezi/. If you need any more info, please feel free to shoot us more questions :-). This looks like a fabulous safari. Really beautiful photos, too – especially love the hippo. 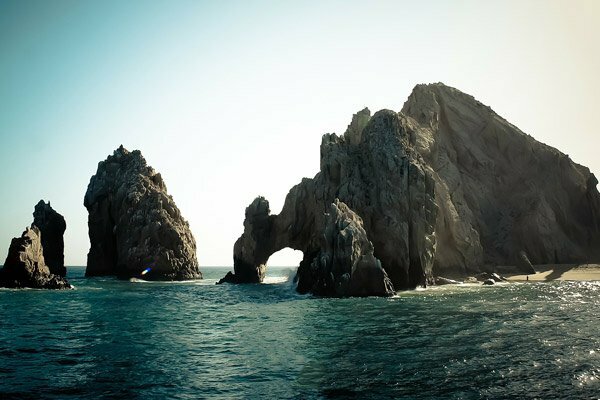 It was a trip of a lifetime… Great decision to go! 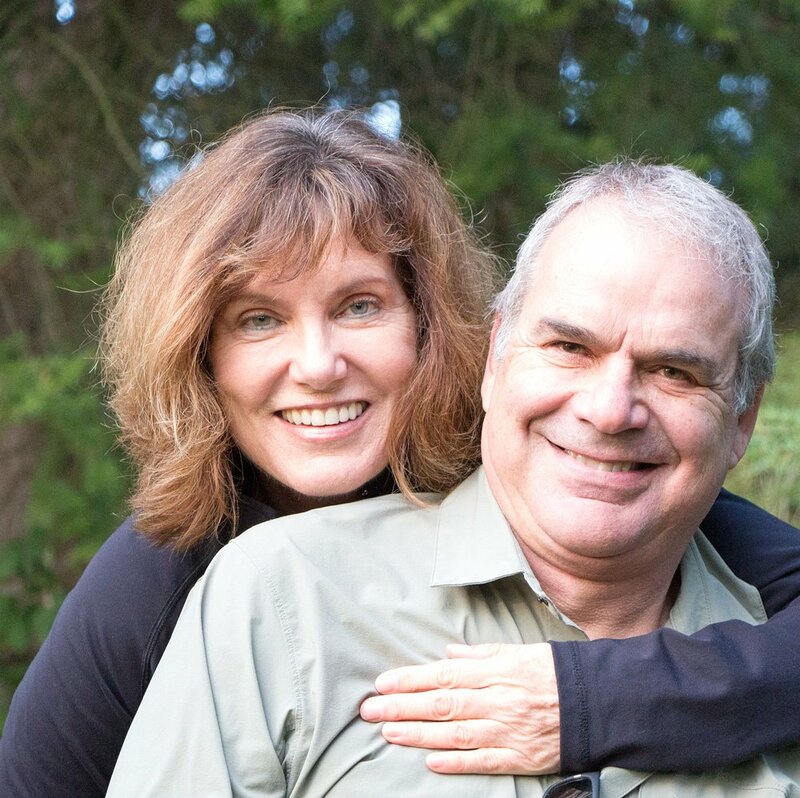 My wife Tamara and I are in the early stages of planning a safari. We haven’t picked a country yet from those on offer, but you seem to have seen a lot of animals. How did you research it all, and what decided you on this particular safari? And who did you book through etc. ? We’ve been feeling the call back to Africa lately. I stumbled upon your post and was immediately drawn back to our last trip to SA. 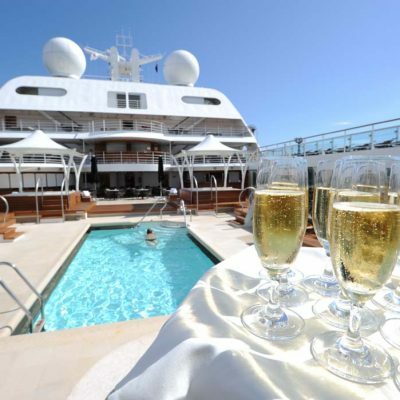 Time to start planning…we miss our sundowners! Looks amazing. 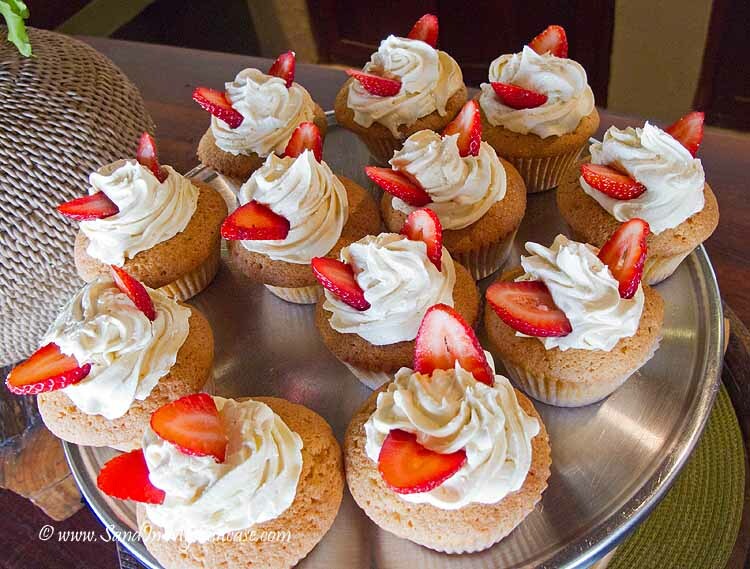 From the cupcakes to the lions at night! What more could you ask for? Wonderful images – that must have been quite an amazing sight to see! 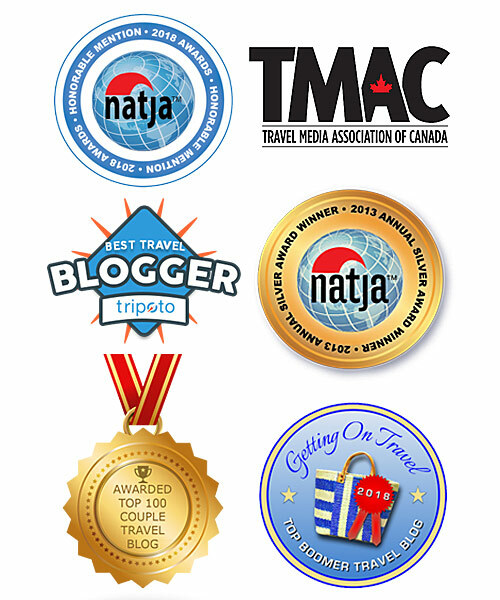 There need to be more travel blog posts that quote Bruce Cockburn. What an epic article on an amazing African safari adventure. I love the idea of chilling with a cocktail or two and watching the sun go down then driving at night for more safari. 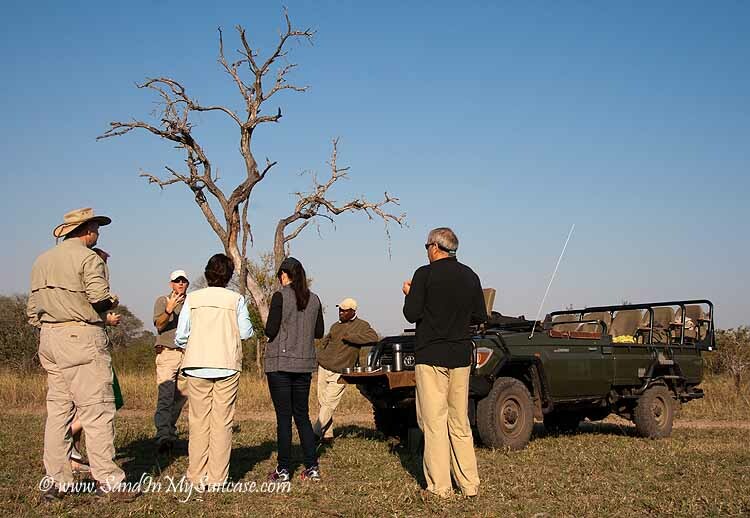 We never tired of going on game drives to look for wild animals – be it early morning, late afternoon or after the sun set… And we look forward to reading a blog post from you with a Bruce Cockburn quote :-). How very cool! Going on a safari in Africa has been high on my list for a long time. But it’s so prohibitively expensive. Amazing photographs ! Felt like I was reading a National Geographic article, that first one with the lion eating the antelope head is quite a shot. Wow. Thanks for sharing! Incredible photos. Sounds like an amazing experience. I’d love to do that some day! This is a fantastic article… and the photography is wonderful! 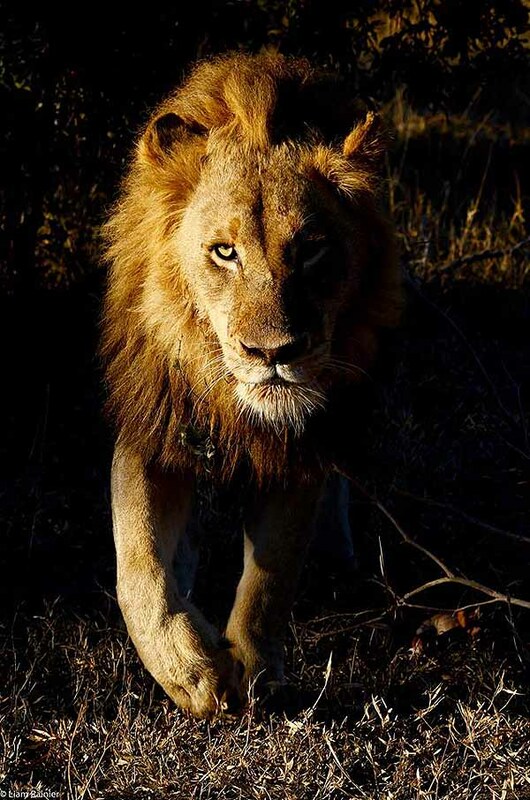 I love the way the article was designed with the close-up of the lion… An African safari is still on my bucket list! Going on safari in Africa was a dream trip of ours – and completely worth it! I’m a real animal lover, would love to see these beautiful creatures in the wild one day, beautiful photos! Hope you get to Africa some day… Seeing these majestic creatures in the wild is very different than seeing them in a zoo :-). Glad you liked this – it was an awesome trip!